(Marc Smith/DiscoverMooseJaw) The list of accomplishments for Justin Almeida this season is long. He led the Western Hockey League with 78 assists, was third in the league with 111 points and signed an NHL contract with the Pittsburgh Penguins. Those numbers are impressive enough by themselves, but when you consider that Almeida did it while playing with basically one arm, that makes it truly amazing. 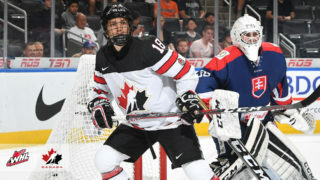 The Moose Jaw Warriors forward suffered a torn labrum in his left shoulder during the opening shift of the 2018 Canada-Russia Series game in Kamloops, B.C. Almeida decided to forgo surgery to play out his 19-year-old season. “I didn’t want to end my season in November, I came into the year wanting to have a great year and have a great year for our team. I knew I wanted to play right from when it happened,” said Almeida. Since that Nov. 5 game against the Russians, Almeida was one wrong hit away from his season being over. That hit finally came in the first period of Wednesday’s Game 4 against the Saskatoon Blades, Almeida went awkwardly into the boards, left the game and the Warriors’ season ended. Almeida only missed four games to deal with the injury and returned to the lineup on a mission. He posted 30 goals and 88 points in 49 games after the injury. “What this young man accomplished — 100-point season, led the league in assists — and what he went through on a day-to-day, week-to-week basis in terms strengthening his shoulder, continuous rehab that Brooke Kosolofski did an outstanding job with, the exercises that he needed to do on a daily and weekly basis, taping, wearing a brace the entire season, it’s just really incredible,” said Warriors GM Alan Millar. Recovery time for a labrum tear can be anywhere between two-to-four months depending on the severity, which includes time to allow the injury to heal. Almeida was injured on Nov. 5 and returned to game action only 18 days later on Nov. 23, posting a goal and two points in his return against the Edmonton Oil Kings. Almeida wore a brace under his equipment throughout the season to help keep the shoulder in place, but he said it was a challenge game in and game out. “It took some getting used to,” said Almeida. “You’re hurting after every game, every time you come to the bench it hurts when you’re fending off guys with it. Playing with the brace limited Almeida’s movement, which required him to change the way that he played on the fly. Almeida’s linemates — Tristin Langan and Brayden Tracey — were inspired by their teammate playing through incredible pain to be in the lineup with them every game. Almeida played two-and-a-half seasons with the Warriors and it was quite the run. The Kitimat, B.C. 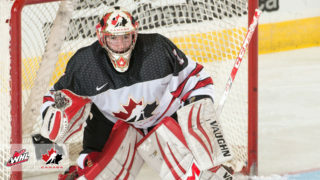 product credits the organization with turning his career around after a slow start with the Prince George Cougars. 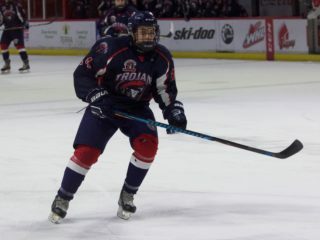 During 169 games in a Warrior uniform, Almeida posted 83 goals and 224 points. He would end up being selected by the Penguins in the fifth round, 129th overall, of the 2018 NHL Draft. 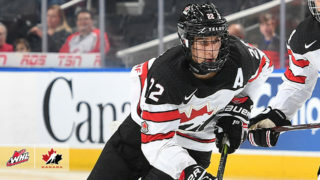 To show how much his time in Moose Jaw, and the trade that brought him here, meant to him, Almeida asked Millar to be his witness when he signed his three-year, entry-level contract with the Penguins earlier this month. Almeida will now be having surgery to repair his shoulder before starting his offseason with the hopes of making the jump to professional hockey next season.